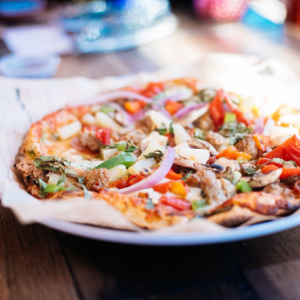 Located on Battlefield Boulevard near the intersection of Coastal Way, MOD Battlefield Boulevard serves up personal-size artisan-style pizzas and salads for lunch and dinner. Customize your order from over 30 ingredients – classic to seasonal, and lots of delicious stuff in between. Come visit MOD Pizza today and see what our MOD Squad can make for you! We support local schools and nonprofits through fundraisers and donations all year, including Foodbank of Southeastern Virginia and the Eastern Shore, a nonprofit that promotes food recovery; acquires and distributes food, clothing and related products; and provides community leadership and education on issues of hunger and poverty. Find out how MOD can support your organization or charity here.